Before understand the Kafka bench-marking, let me give a quick brief of what Kafka is and a few details about how it works. Kafka is a distributed messaging system originally built at LinkedIn and now part of Apache Software Foundation and used by variety of companies. The key abstraction in Kafka is the topic. Producers publish their records to a topic, and consumers subscribe to one or more topics. A Kafka topic is just a shared write-ahead log. Producers append records to these logs and consumers subscribe to changes. Each record is a key/value pair. Single producer (single thread) and single consumer producing asynchronousyly on a topic with replication factor of 3 and 1 partitions. 9 producer (3 producer with three thread so total 9 (3*3) ) and 3 consumer producing asynchronously on a topic with replication factor of 3x and 1 partitions. In this context, a producer running in async mode would mean that the number of acknowledgements the producer requires the leader to have received from its followers before considering a request complete is 0. Case 1: Single producer (single thread) and Single Consumer producing asynchronously on a topic with replication factor of 3 and 1 partitions. 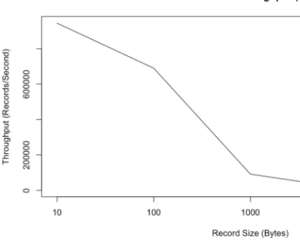 3) Throughout and Record -Size are inversely proportional.With more Record-size we have less throughput. Case 2: 9 producer (3 producer with three thread so total 9 (3*3) ) and 3 Consumer producing asynchronously on a topic with replication factor of 3x and 1 partitions. By Increasing the number of Producer(compared to first case) the Latency of the producer also increases . 1.Single producer (single thread) and single consumer producing asynchronously on a topic with replication factor of 3 and 1 partitions. 2. 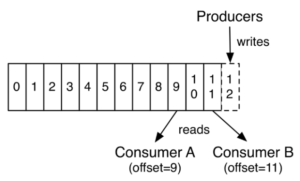 9 producer (3 producer with three thread so total 9 (3*3) ) and 3 consumer producing asynchronously on a topic with replication factor of 3x and 1 partitions. If we compare above result with Scenario 1 case 1 result ,we found that the avergae latency with EBS ST1 disk is very low. With increase in producer count (compared to above Scenario 2 case 1) the Latency of the producer also increases .